Duck Hunt began life as a classic Nintendo light gun toy in the 1970s. A moving light unit would project ducks onto a wall, and you would have to shoot them with the light-sensing gun. 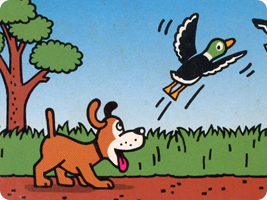 With the arrival of the NES Zapper, Duck Hunt was adapted for the home console market, introducing the infamous dog who would mock you for missing a shot. His fame eventually led to a playable role in the Super Smash Bros. series.